What Is Stephen Miller’s Job, Anyway? If the Trump administration’s chaotically implemented and legally suspect “travel ban” winds up unraveling, it looks like the person who is going to take the fall for it is White House senior adviser Stephen Miller. According to most accounts, Miller and his mentor, “chief strategist” Steve Bannon, were in charge of drafting and promulgating the orders that put this poorly thought-through policy into place. And Bannon is way too far up the food chain in Trumpland to suffer the consequences of a screw-up. Joe Scarborough broadcast that the more junior Stephen needs to be taken to the woodshed. So this raises the obvious question: Who put this guy into a position to go on a power trip and bypass the rest of the administration? Miller didn’t just wander into the White House and execute a coup. 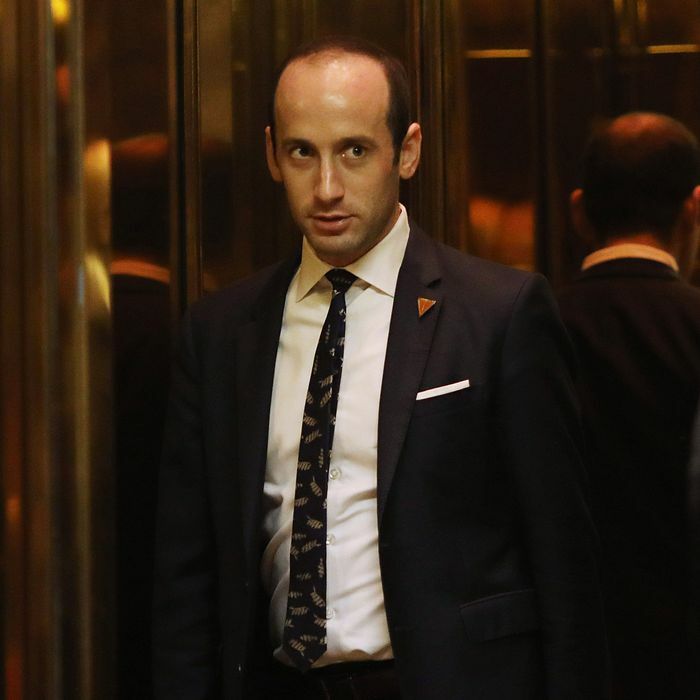 Miller first gained big-time national attention when he was revealed as the major wordsmith (with an assist from Bannon) of Trump’s presidential nomination acceptance speech in Cleveland. He was also an important liaison between Trump and his earliest and most important congressional ally, Senator (and now Attorney General-designee) Jeff Sessions. Eventually he emerged as a sort of combination speechwriter, policy wonk, and all-purpose promoter of the Breitbartian wing of the Trump movement — a key cog in the machine that made Trump into one of the less likely populist figures in American history. Miller also cuts a deeply unsettling figure, even to many in his own party. His nine-year career working for some of the most politically fringe figures on the Hill — he also worked for Michele Bachmann and helped David Brat in his primary defeat of Eric Cantor — was preceded by a trail of writings and provocations that go all the way back to high school, one that has raised the eyebrows of even conservative Republicans. It’s not so funny anymore, is it? In any event, nobody has yet explained what a near-adolescent speechwriter and policy adviser was doing during the first week of the Trump presidency, essentially firing off instructions to U.S. diplomatic and customs officials around the world and touching the lives of thousands of real people. What is his job, anyway? Immigration czar? It’s hard to say. In the end, Miller’s relationship to Trump, Bannon, and Sessions will likely keep him from too much of a spanking, if indeed Team Trump decides there is even a problem here. If not, it would hardly be the first time these people ignored respectable opinion and brazened it out. If they really cared about the opinions of media types (even friendly ones like Scarborough) or Republican pols, they wouldn’t have gone to work for Donald Trump in the first place, would they?